From Monday till Thursday (16 to 19 Apr'18) this week, a hill in Melaka became the most heavily-shelled place in Malaysia. The summit of this hill was ground zero for Markas Tentera Darat’s (Malaysian Army HQ's) Network Centric Operations (NCO) capability demonstration at the Defence Services Asia (DSA) arms show. 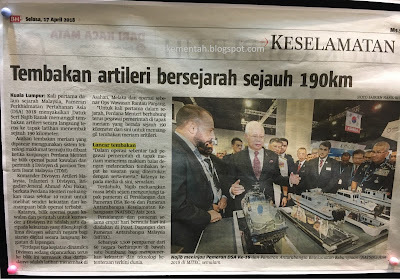 As the world’s defence industry descended on Kuala Lumpur (KL) to talk shop at DSA with top guns from Asia-Pacific armed forces and elsewhere, gunners from 4 Rejimen Artileri Diraja (4 RAD) stood by with a full regiment of 18 105mm Pack Howitzers. 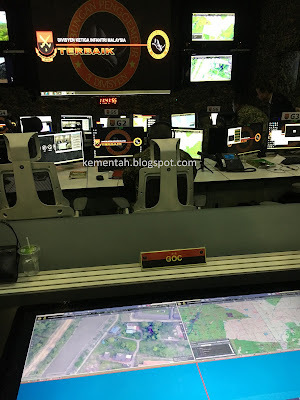 Several times a day, fire control orders relayed via satellite from the “command post” (CP) set up at the Malaysian Army pavilion at DSA would see 4 RAD spring into action. The VVIP would go through scripted voice commands under the tutorship of 3 Divisyen staff officers, whose formation staged the NCO demo. These commands established contact with 4 RAD gunners some 190km away, designated the target and ended the sequence with the command: “Fire for effect. Fire, over!”. Almost always, the response from an unknown gunner from 4 RAD would be a rousing “TEMBAAAAK!” (Fire! ), screamed into the microphone from the Asahan range in Melaka with bone-chilling ferocity. In KL, all eyes would be on the video wall in CP, which was dimly-lit to enhance the video footage and electronic maps displayed to explain what NCO entailed. One screen showed the 105mm guns firing a salvo with near simultaneous appearance of gun smoke while the main home theatre-style screen in the centre zoomed in on the target. Seconds later, a series of 18 shell bursts would erupt on the summit of the lonely hilltop in ulu Melaka as point detonating 105mm shells from a full artillery regiment rearranged the landscape. A drone would then orbit the target, with the narrator explaining that this was for battle damage assessment. A ripple of applause from the audience for 4 RAD’s ribut api (fire storm) and the 20-minute show would be over. Wayang (theatre)? Yes. But the theatrics worked its magic. 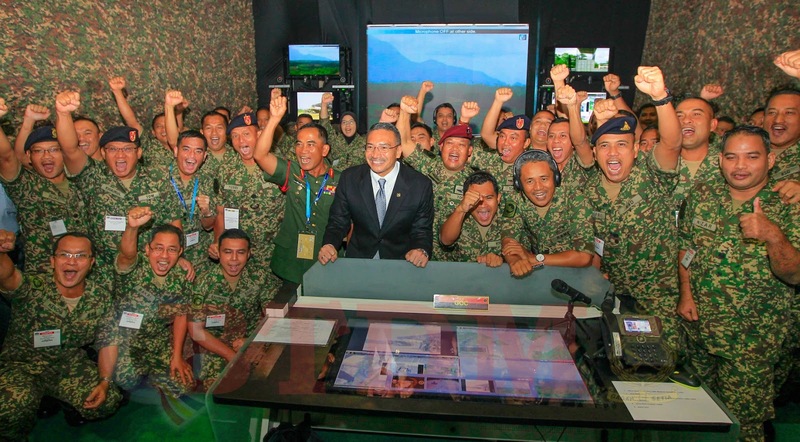 Malaysia’s official news agency, Bernama, dubbed the Malaysian Army’s NCO prowess as “digital muscle”. The Malay-language newspaper, Berita Harian, highlighted the Malaysian Army’s ability to direct artillery fire from a distance of 190km away. Malaysian media also brought the story to its domestic audience. 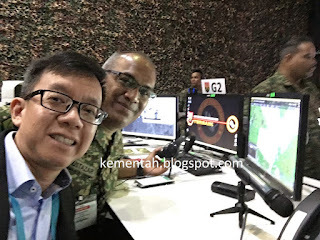 Senior commanders such as the Grup Artileri Pertahanan Udara (army air defence) commander (above) explained NCO in simple terms during his Malay-language television interview with Radio Televisyen Malaysia. From what Senang Diri observed, the audience loved the NCO demonstration that showcased the Malaysian Army’s determination to push into the digital age. 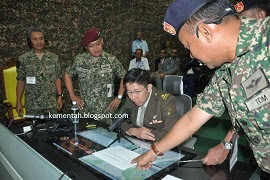 Take the instance when a Malaysian Army general walked unannounced into the CP, asked for call signs and a set of headphones, and then proceeded to take command ala Call of Duty. This was totally off-script. The general apparently caught some soldiers networked with the CP off guard. Not surprisingly, the unscripted orders relayed from KL did not always result in the intended effect and the general terminated one exchange with an exasperated “I think we are on the wrong frequency, over”. Then there were VVIPs who issued commands into the table top microphone ever so delicately, as if the Yang Berbahagia was speaking to his secretary on the office intercom. As a result, it was possible that the message was not heard on the other end of the line outfield in ulu Melaka where ear drums might still be ringing from the last salvo. As an awkward silence prevailed, the Yang Berbahagia would be prompted to repeat the command, sometimes again and again. In the case of one elderly Tun - who has a distinguished voice that spoke in Queen’s English – the lack of action on the 4 RAD gun line resulted in a flurry of activity as the communications cell sought to ensure the gunners could hear his lordship loud and clear. Markas 3 Divisyen (HQ 3 Div) took things in their stride. Staff officers adjusted their script calmly and professionally without missing a beat. In short, such moments were never show-stoppers. Considering that the Malaysian Army decided about a month before DSA to showcase its digitised NCO capabilities, Markas Tentera Darat accomplished its intent masterfully. The easier choice for Markas Tentera Darat when setting up shop at DSA’s new venue was to follow the template for previous shows. 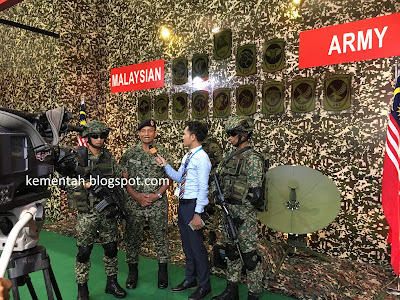 This invariably comprised a pameran statik dan aset Angkatan Tentera Malaysia (static display of Malaysian Armed Forces assets) and the obligatory mock attack. At DSA 2016, it was Malaysian special forces who put on a rousing display with blanks, flash bangs and mock explosions during a hostage rescue mission. While DSA 2018 had no mock attack, the Malaysian Army nonetheless put on a far bigger and more significant capability demonstration. Think about it: The Malaysia Army's display area stretched the length of Peninsular Malaysia from Melaka to the Malaysia-Thai border with three areas of operations networked to the CP in the heart of Malaysia's capital city. This made the NCO demonstration the biggest ever staged by the Malaysian Army at a DSA show. Three AOs were used for the following scenarios. At Asahan in Melaka state, 4 Briged (Mekanize) and 4 RAD joined forces to demonstrate armoured manoeuvre and firepower, with live ammunition employed. At Pusat Latihan Darat (PULADA), the Army Training Centre, troops staged an operation in a built-up area. The third AO at Rantau Panjang, along the river in Kelantan that marks the Malaysia-Thai border, brought video footage from an Operasi Wawasan infantry patrol, deployed for border security duty, right to the NCO show centre. Senang Diri understands that the planning stage considered two other AOs. These would have involved the Malaysian Battalion (Malbatt) in Lebanon and the crack 10th Briged (Para) Pasukan Atugerak Cepat (Rapid Deployment Force) in Melaka. These two AOs were dropped after careful consideration as planning staff reckoned that DSA visitors might be pressed for time. Good call. What would you have done if you were in charge? Short of time and short of money, and tasked to operate in a brand new venue which almost all of your officers had never been to, would the option of gunning for the usual template have appealed to you? The back story to the Malaysian Army's NCO capability demo helps us better understand what the Malaysians sought to achieve. By staffing the NCO display with officers, men and women who appeared well-briefed on the complexities of realtime C4ISTAR, the confidence and technical competency of NCO hosts ensured most visitors walked away with a positive impression of the ATM in general and of 3 Div, in particular. The division, which is the Malaysian Army's first combined arms division, is currently spearheading the army's NCO drive. Whether by accident or design, all visitors to the South Entrance of the DSA venue at MITEC – the Malaysian International Trade & Exhibition Centre – walked or drove past the satellite dishes (above) so essential to the success of long-range comms for the NCO demonstration. 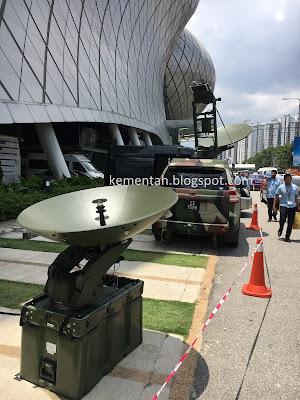 At parking bays just outside the South Entrance, three vehicles from Rejimen Semboyan Diraja (RSD) deployed with their satellite dishes in full flower. These vehicles underscored the point made by the narrators at the NCO demo – that the battle scenes were “live” and not pre-recorded. Interestingly, the narration for the NCO storyline was done in English even when some audience groups comprised principally of ATM personnel or Malaysian nationals. As DSA draws delegates from across the globe, it was perhaps fitting that the Malaysian Army make its presentation in English. Even so, the fluency and confidence of officers who spoke of the common situation picture and sensor-to-shooter loops was commendable. Another interesting factoid: The NCO show was brought to you wholly by the Malaysian Army. With budgets tight, the job of building the Malaysian Army pavilion was left in the good hands of Kor Jurutera Letrik Dan Jentera Diraja (KJLJD), the Army’s Royal Electrical & Mechanical Engineer Corps. 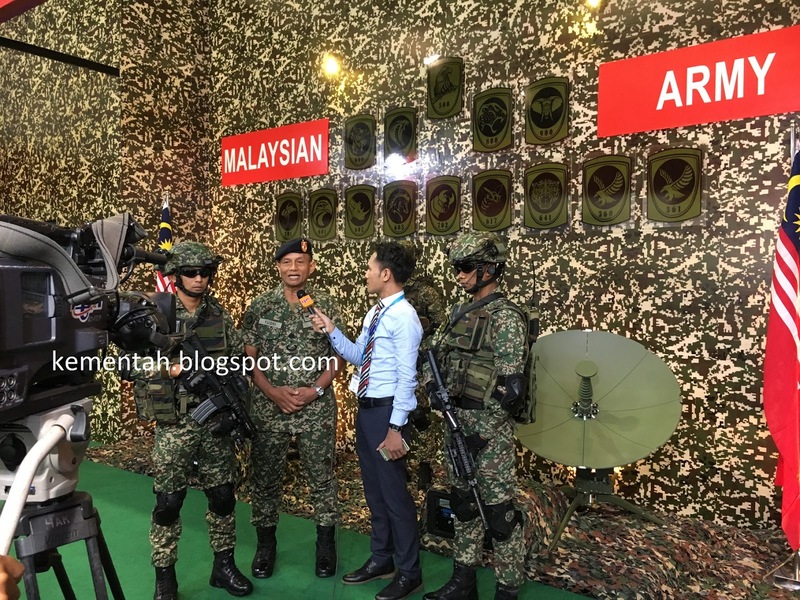 This is why the structure of the Malaysian Army booth looked different from those of neighbouring DSA exhibitors. That said, KJLJD's efforts looked no less showworthy. Thanks to the foresight and daring of Markas TD, the NCO capability demo brought the Malaysian Army’s presence at DSA to a whole new level. We can’t wait to see what they have planned for DSA 2020. Gagah Setia!